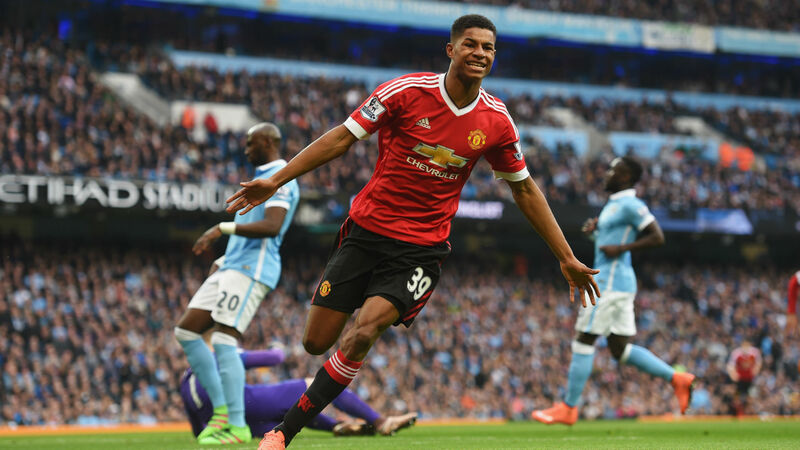 Marcus Rashford is relishing the opportunity to take on Manchester City again, revealing his 2016 derby winner for Manchester United was the highlight of his young career. The England forward has won the FA Cup, League Cup and Europa League, as well as featuring for his country at two major tournaments, but Rashford harks back to the very start of his time in the United first team for a moment he treasures above all others. In the 2015-16 season, less than a month on from his debut for the club, Rashford netted the only goal of the game at City to settle the derby - and he reflected on that strike ahead of Sunday's latest clash. "For me, personally, to score the winner there was the biggest feeling in my career," the 21-year-old told United's official website. "Obviously, winning trophies is always your aim, but I'd say, on a personal note, that was the biggest feeling I've had. "Derbies are always tough games, but I think they're the games in which you always learn the most. There can be games where you win 3-0 or 4-0 and everyone's happy but what have you learnt from the game itself? "Of course you learn in every game and you're delighted with the result but there are games where you win 1-0 or you draw 1-1, when things are that little bit tighter, and what you learn from those matches you then take into the next one. They're the games that I love to be involved in." United won at the Etihad again last season but had to come from two down to claim the 3-2 victory that put City's title celebrations on hold. Rashford wants another positive result this weekend, yet he hopes the three points can be secured in less stressful circumstances. "Last season's derby at City was amazing. I was on the bench for that game and I was itching to get on," he said. "We were so focused on not losing that game, winning was the only option for us when we went out in the second half. That feeling of being two goals behind was a horrible one and coming back from that was amazing. "We're all looking forward to Sunday's match and hopefully we can leave the stadium with the same feeling again."